For those looking for a more short-term golf carting experience, we offer gas-powered golf carts for rent. They can be reserved on a first-come, first-served basis for the hour, the day, the weekend, the week, even monthly! See below for rental rates, availability and to make your reservation. Renters must be at least 21 years old and show a valid driver’s license. A full copy of the rental agreement, including terms and condition, can be found below. This agreement must be signed to complete a rental reservation. Big O's Golf Carts reserves the right to deny rental services to any person they determine unfit to use their golf carts. Our Standard Rental fleet includes 4-Passenger and 6-Passenger refurbished EZGO RXVs and EZGO TXTs. They include LED head and tail lights, a fold-down windshield, an extended long top, a flip-down rear seat for cargo, and other standard options. Seatbelts and weather enclosures are available on some models. We also offer an Elite Golf Cart Rental Package. 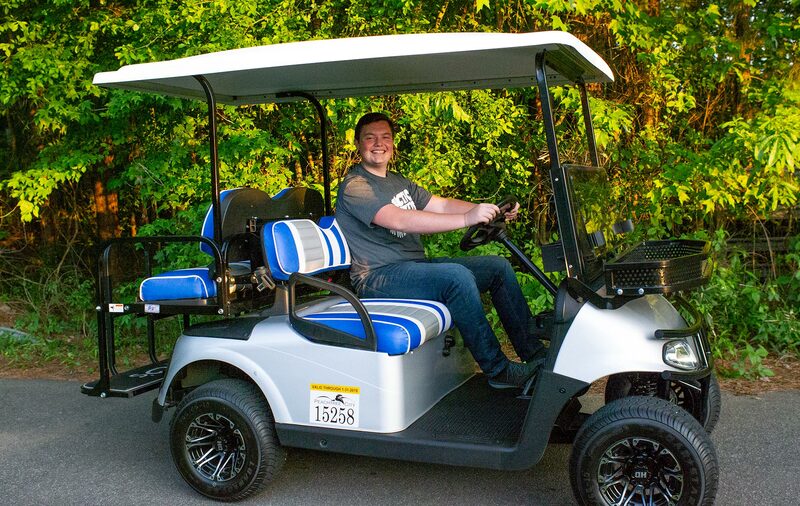 This package includes 4-Passenger gas-powered golf carts with various upgrades, including but not limited to, custom paint and seat covers, upgraded wheel packages, and Quiet-Gas technology. These are available in limited quantities on a first-come, first-served basis. Rates are listed below. *Elite Golf Carts are not available for monthly rental. Renters are encouraged to familiarize themselves with the 100+ miles of golf cart paths throughout Peachtree City, and maps can be purchased at the time of your golf cart reservation. In addition, renters are encouraged to know the traffic laws and safety rules, to ensure a safe and enjoyable experience. Please review Terms & Conditions below. Normal wear and tear on the vehicle(s) is to be expected, but abuse or damage to the vehicle(s) will be the Renter’s financial responsibility. Any cost to repair or replace the vehicle(s) and their accessories as a result of any acts of accident, vandalism, fire, or theft will be the Renter’s responsibility. Should the vehicle(s) be damaged beyond repair or stolen during the term of this contract, the Renter is liable for the replacement cost of the vehicle(s). The Renter will be responsible for routine maintenance of the vehicle(s) for the duration of the contract (i.e. ethanol-free gas, oil, air pressure, etc.). No one under the age of 21 is permitted to rent or drive the vehicle(s). This is the Renter’s responsibility. BIG O’s GOLF CARTS, LLC retains the right to terminate this agreement and take possession of its vehicle(s) if driven in Off-Road scenarios. The Renter acknowledges that the title to the vehicle(s) contracted hereunder shall at all times be held by BIG O’s GOLF CARTS, LLC. The Renter is liable for any and all property damages and/or injury to any passengers or surrounding people caused by use of the Golf Cart. BIG O’s GOLF CARTS, LLC is not liable for any such loss. Golf Cart reservations can be cancelled with a full refund up to 48 hours prior to the first rental day. If not cancelled within 48 hours prior to the first rental day, you will be charged a $50.00 cancellation fee. By signing this contract, the Renter agrees to abide by all our policies as well as Peachtree City Golf Cart Rules or will be required to answer to the Peachtree City Police Department. Some of our Golf Carts exceed the height limit of the standard Golf Cart tunnels in Peachtree City. It is the responsibility of the Renter to ask Big O's Golf Carts if the golf cart they rent exceeds the standard tunnel height specifications. Renter is responsible for damages incurred on the cart(s) due to entering a tunnel that has insufficient height clearance. Golf Carts flip easily when turning at high speeds. Flipping the cart is prohibited and the Renter is responsible for ALL damages due to a flipped golf cart. No "Off-Road" driving of the Cart, and no overloading the Cart with passengers. If the Cart has not been committed to another party, the Renter may extend the rental term; payment is required at that time. In the event the Renter fails to return the Cart at the agreed upon date, any additional charges incurred are the Renter’s responsibility & payment will be due upon the return of the Cart. Renter is responsible for all towing fees that arise during the rental period. Special Disclosure Statement: Our rental carts are NOT perfect; they are heavily used & may present various small issues. Absolutely NO REFUNDS will be issued, for complaints AFTER the Renter’s rental period has ended, for reasons including but not limited to: Not having fun, engine noise, smell of gas fumes, speed of cart, cosmetics (body damage), minor mechanical problems (i.e., fuel gauge not working, lights/horn not working, rattles, flat tires, etc. ), & citations made to the Renter while the cart is in the Renter’s possession. If a Renter has a problem/complaint with any component of the rental cart, it is the Renter’s responsibility to notify Big O’s Golf Carts’ Staff within the first 2 hours the cart is in the Renter’s possession if any refunds/exchanges are requested (but NOT guaranteed). Refunds will be issued at the owner’s discretion.